2:10 p.m. 8/16/85 Jasper, Alabama tornado. Photo taken by Douglas Pearson of the Daily Mountain Eagle newspaper. Source: Obsevations of the Hurricane Danny Tornado Outbreak of 16 August 1985, by Eugene McCaul, Jr.
4:37 p.m. 8/16/85 Redstone Arsenal Airfield tornado, Huntsville, Alabama. Photo by Andrew Junkins, Avionics Supervisor. 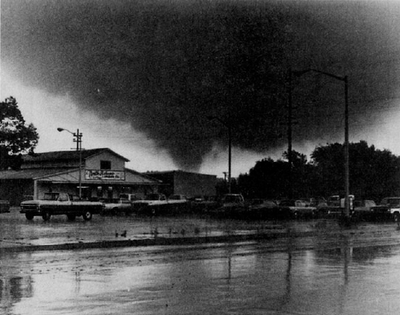 Source: Obsevations of the Hurricane Danny Tornado Outbreak of 16 August 1985, by Eugene McCaul, Jr.
4:38 p.m. 8/16/85 Redstone Arsenal Airfield tornado, Huntsville, Alabama. Photo by Andrew Junkins, Avionics Supervisor. Source: Obsevations of the Hurricane Danny Tornado Outbreak of 16 August 1985, by Eugene McCaul, Jr. In a very very interesting paper authored by Eugene McCaul, Jr. about the tornadoes that struck Mississippi, Alabama, and Tennessee on August 16, 1985, he describes the atmospheric conditions that led to an unusually violent tornado outbreak for a land-falling tropical system. These tornadoes were spawned by the remnants of Hurricane Danny, which had made landfall on the Louisiana Coast the previous day. 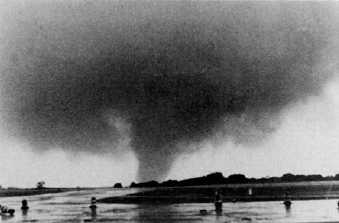 This article includes photographs of two of the hurricane-spawned tornadoes, the first such documentation to be published, showing that the tornadoes displayed multiple-vortex structure and formed beneath wall clouds. Their account is about two thirds of the way down the page on the link, but here are some excerpts. It was at 11AM CDT, right during my seminar, that the first Alabama tornado (an F2) struck Parrish, a small town about 80 miles southwest of Huntsville. Shortly thereafter, the town of Jasper was hit by an F2, and before the day was over some 53 other communities had reported tornado damage in Alabama, Tennessee and Mississippi. The radio station I listened to on my way to and from lunch didn't say anything (!) about the storms, at least while I was tuned in, so I didn't know anything about the remarkable goings-on to my southwest. In fact, I was beginning to wonder whether Huntsville would even get a decent rain that day. I wedged my way through the crowd of 30 co-workers, standing at the North Entrance of our building to get a look at a magnificent wall cloud with a multiple vortex tornado just about three miles northwest, moving north. To the north, there was a very ominous band of low clouds extending east from the wall cloud, but at first, I couldn't tell if the band represented the mesocyclone's pseudo-warm front or gust front. Since the storms were moving north and there was no evidence of a gust front to the west, I surmised that the low cloud band was probably the gust front--and that it had caused the winds I had heard a few minutes earlier. Cloud bases under this band were ragged, almost blurry looking and very low, perhaps only 300 feet above the ground while to the south was about 1,500 feet. A moderate shower of large raindrops continued to fall, accompanied by a 10-15 knot south-southwest wind, but there was still no thunder or lightning. 'Does anyone have a camera?' I pleaded, but nobody was listening. I noted the time on my watch, 3:42PM CDT, rushed back to my office, put up the 'gone fishin' ' (i.e. chasin') sign, and took off for my apartment to get a camera. As I tore out of the building, the loudspeakers in the halls declared: 'Warning! A tornado has been sighted on Redstone Arsenal. All personnel take cover in designated areas until further notice.' Of course, at that point, there was no longer any danger from this particular storm--at least not to the Arsenal. - - - It was early rush hour as I departed, and rush hour in Huntsville is not a pretty sight--even on a dry day. I made several unauthorized U-turns in order to get home 'efficiently,' and the native Alabamans seemed to be impressed; a couple of them even honked their horns at me. When I got to my apartment, the other tenants were all outside, looking to the northeast at the departing storm. The radio crackled with tornado warnings for Madison and Limestone Counties. I grabbed my camera and headed west. Now away from the traffic, the radio was starting to issue tornado warnings on another round of storms, moving up from Cullman and Morgan Counties --and there was a report of a tornado on the ground south of Decatur, which is about 20 miles southwest of Huntsville. I headed northwest on Route 72 toward Athens, hoping to intercept the mesocyclone, which I figured was moving through Decatur at that time. The radio was remarkably free of static. After a few miles, I encountered a very heavy rainshower -with visibility down to a quarter-mile and figured the storms were already on me. I found a spot on the side of the road, where there was an open view to the south, and waited for the rain to stop. A bright line appeared on the southern horizon and another band of low clouds swept over, but behind this gust front there was no evidence of a wall cloud to the west. However, now the view to the east, back towards Huntsville, looked promising, so I headed back towards town. To the east, there were several purplish bands of north-south ragged low bases, with one especially dark base behind Rainbow Mountain a 400 foot hill that was scraping the cloud bases just to my southwest. There was rotation almost everywhere in the low clouds, and I noted on my tape recorder that I expected to see a tornado any minute. As I continued to race east toward the presumed well cloud, a small break appeared in the stratiform deck above me, giving me a brief glimpse of big gray towers -leaning sharply to the north and penetrating the mid-level clouds higher up. In hopes of catching e tornado, I blew off picture options and headed north on a road named, appropriately, Wall Highway. I believe the key to the potency of the Danny outbreak was the development of a narrow dry intrusion, which showed up clearly in Danny's southwest quadrant in the satellite photos. This is something to look for in preparing for a hurricane tornado chase...Most importantly, don't leave your camera at home in favor of an umbrella. That way, if you get lucky, you'll have something of your own to show for it!" As the center of Danny travelled through Mississippi, North Alabama was in a prime location for rotating storms. I was in Huntsville at the time and as I recall there was a lot of light rain and not too much (if any) thunder with these storms. My Dad witnessed the Redstone Arsenal tornado shown above while standing outside of his office in Huntsville's Research Park. I remember standing outside on that day watching the clouds. I don't know why I didn't go look for the storm. I don't think we had very good access to radar then and my parents would have had a fit if they knew I was out doing that. I did, in fact, tape the coverage on local television stations out of Huntsville and Birmingham. Here are some videos of the television coverage from that day which I uploaded that capture the event well. 8/16/85 The Weather Channel Coverage - John Hope, et. al.